This is not meant to degrade those with retardation. 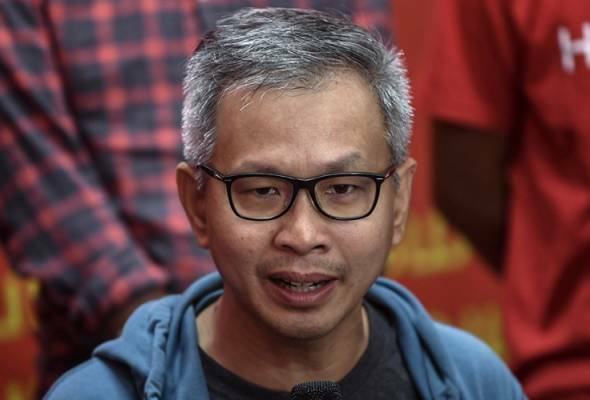 Tony Pua’s campaign at the Cameron Highland by-election showed signs he could be a retard. Prior to that, it was Lim Guan Eng showing similar trait. His official statement against Pahang government made with an MOF insignia confirmed he has impaired condition. Some would defend both of them as arrogant or uncouth or “bulldozer”-type of people. How do you then explain their repetitive behaviour to keep using RM1 trillion debt or 1MDB as the only explanation or Dato Najib as the only blame? It is also natural for those with retardation to not realise their own fault. Guan Eng will never ever admit he is wrong or made mistakes. 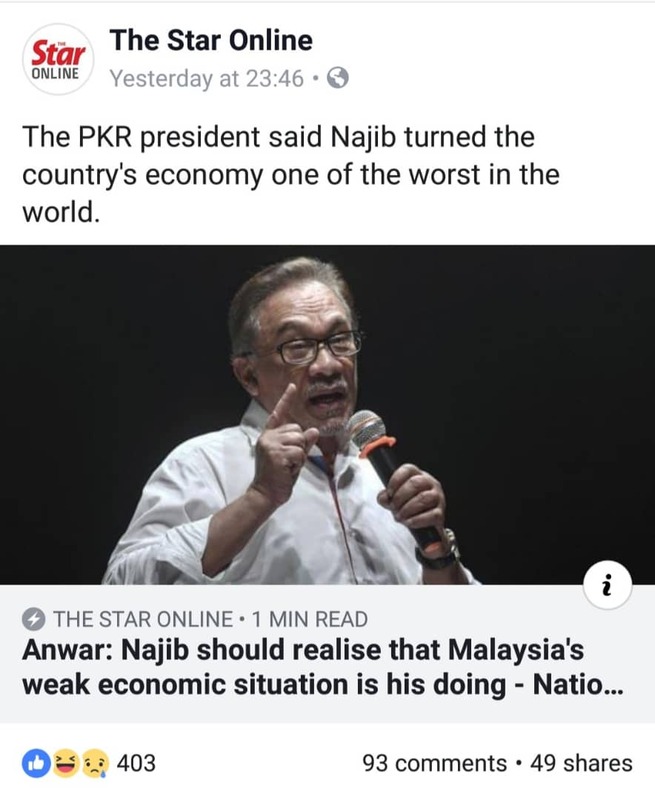 He accused Najib for government having RM1 trillion debt, but himself racked up more debt and spent more money then Najib’s administration. A Professor from Duke University in the US was puzzled why the new government, which accused the previous government of corrupt, honoured and acknowledged 1MDB debt. Having committed tax payer money, he will neither admit he erred nor acknowledged the Odious Debt Doctrine. It is a complex neurobehaviourial side of Guan Eng. The reasons are enough to suspect both Tony Pua and Guan Eng are autistic. DAP Selangor did the right decision to reject Tony. Let’s start with Tony Pua. During his campaign, Tony questioned the integrity of BN candidate, Ramli Md Noor as a high ranking police official. 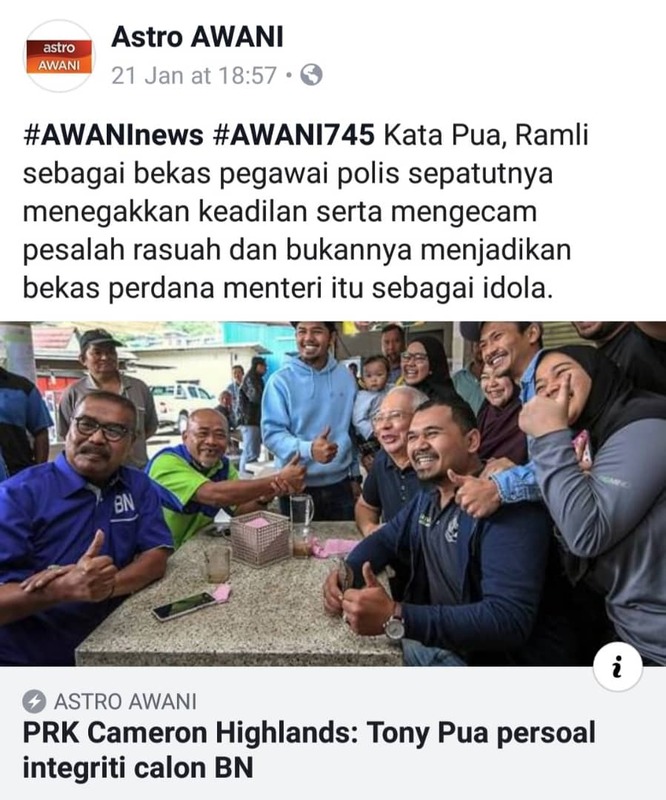 Astro Awani reported Tony accusing the retired police ACP for being in co-hoot in the 1MDB scandal and with Najib. As a high ranking police officer, he did nothing to expose or investigate Najib. Instead he look up to Najib with high esteem. Notice the lack of sensitivity and the repetitive behaviour? 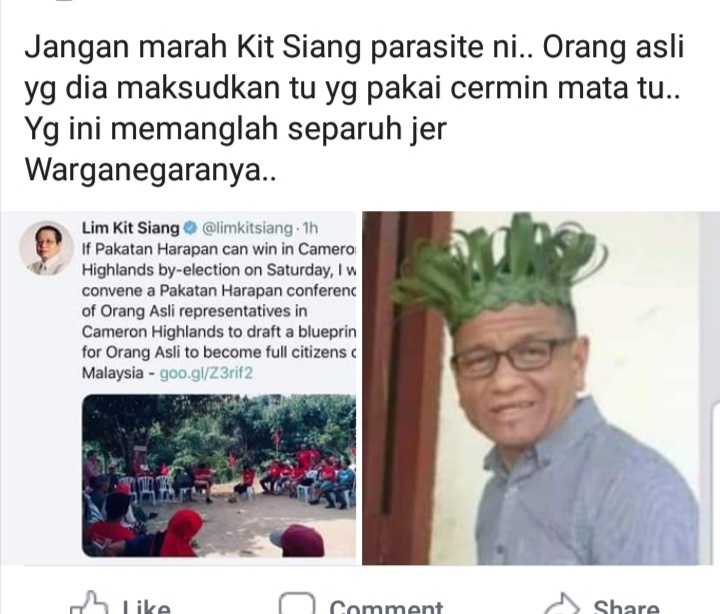 Tony explicitly rubbished Ramli in front of his kin folk, in which the Orang Asli there looked up to Ramli with high regards as a high ranking police officer, highly educated, exemplary model and one of their own. 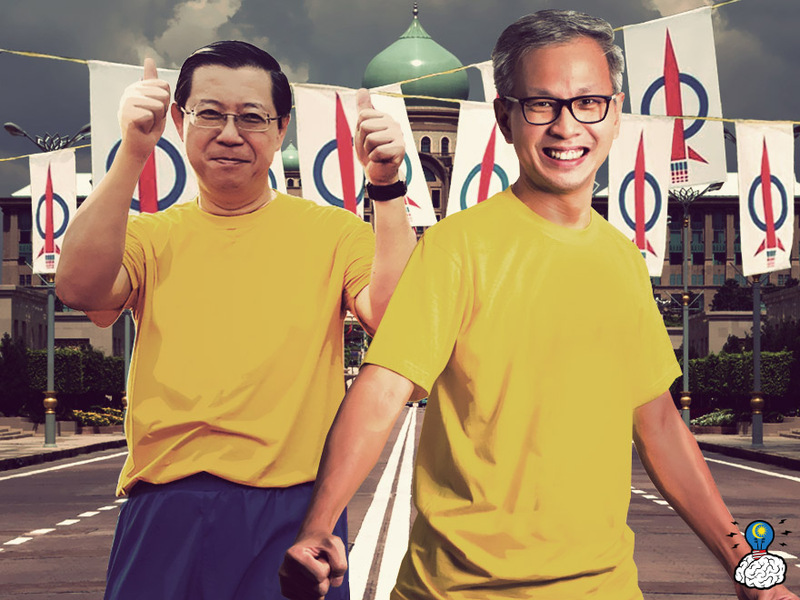 Tony’s austistic inability to realise his attempt to give his fellow DAP aka PH candidate a fighting chancecould backfire. Ramli’s last position before retirement was Assistant Director in charge of Finance / Banking / Insurance / Cooperative at Bukit Aman’s Commercial Crime Investigation. The coverage of his responsibility is wide. He is no more the level to do investigation. Even if he knows of the 1MDB investigation, does Tony expect a professional lawman do the unprofesssional, unethical and unlawful act of leaking confidential preliminary investigation findings? Tony cannot expect Ramli to finish investigating in his two years as Assistant Director. Till today, has police completed investigation and finish collating the evidences? What happened to last year’s first Ramadhan raid by Amar Singh? In the meanwhile, Tony insulted police personnel who some may have casted their votes for PH in the last GE! Tony also insulted the rural voters of Cameron Highlands with the remark that mega projects were cancelled for money to be re-channelled to rural areas. Really? Why then are social allocations to farmers, fishermen, agriculture projects, rural school allocation and projects, rural road projects for Sarawak interiors, and many many more cancelled, but yet New Era College and private Chinese schools could get government contribution? Tony lack of sensitivity to other’s may have deprived him the senses to understand why he did not make the cut in the top 20 line-up in the DAP Selangor election. Simply, he failed to emphatise with the DAP members and Chinese businessmen. Tony failed in assisting Guan Eng to formulate policies and strategies for the Ministry of Finance. He is no market wizard as Tun Daim sarcastically called in private. Menteri Besar of Pahang responded to desribe Guan Eng’s statement as “janggal” or in English to mean odd or strange or out of ordinary. It is similar to the EC’s election by-law to disallow use of government assets and facilities as done earlier by Azmin Ali, Mat Sabu, Gobind’s Deputy and caught red-handed was Tengku Zulfuri, DAP’s Deputy Minister for Water, Land and Natural Resources. It is lack of sensitivity of Guan Eng to what other’s think as outright abuse by DAP in their campaign that made him issue such statement. 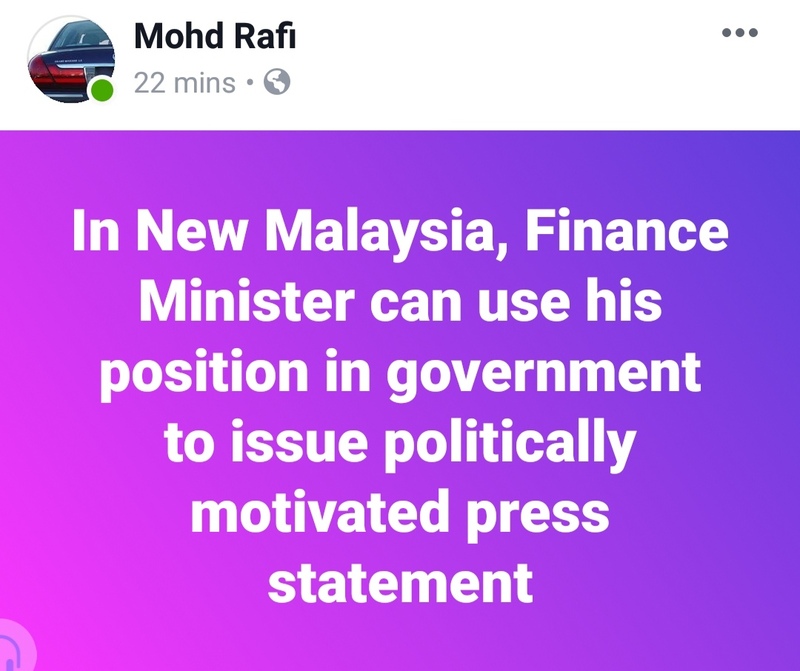 He may not realised that he is autistically repeating the similar line to blame government’s financial constraint to to 1MDB, Najib and Jho Loh. 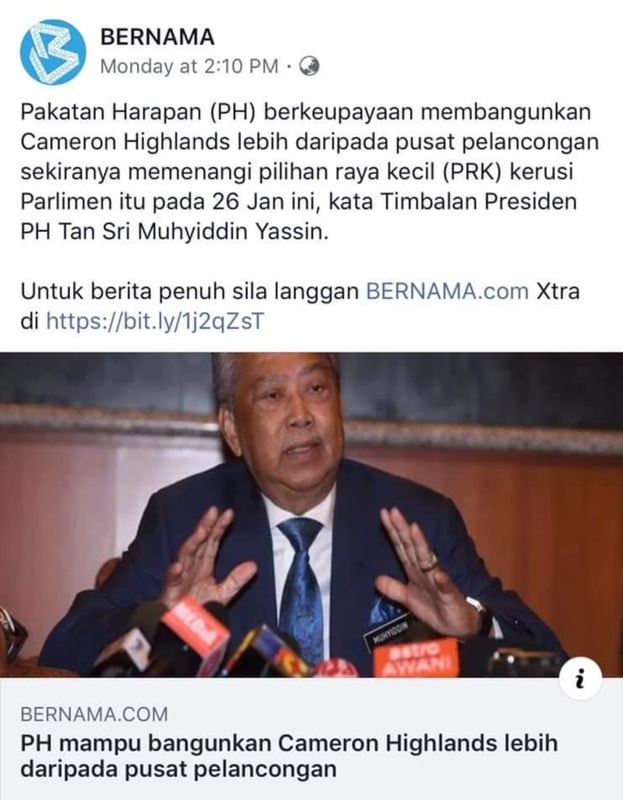 “Guan Eng tetap berkata Pahang tidak mampu untuk membantu penduduk di Cameron Highlands kerana Pahang ada hutang yang tinggi. “Eh? Guan Eng bukan berkali-kali berzikir bahawa hutang kerajaan pusat terlalu tinggi pada tahap RM1 trilion? “Bukankah defisit kerajaan pusat di dalam belanjawaan Guan Eng sendiri juga lebih tinggi berbanding di bawah BN. 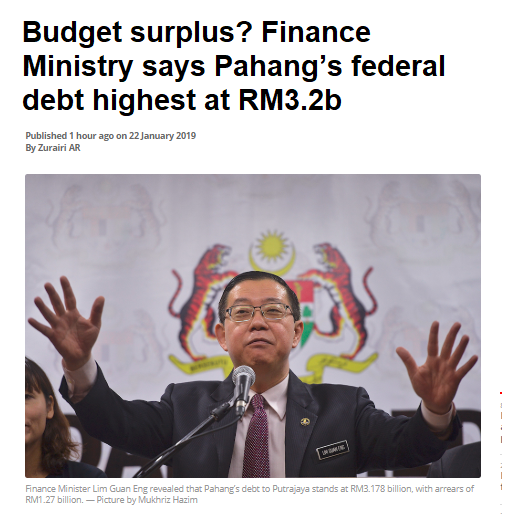 “Bajet surplus dan hutang RM3.2 bilion, tak mampu tolong. “Bajet defisit yang lebih tinggi dan hutang RM1 trilion, mampu tolong? 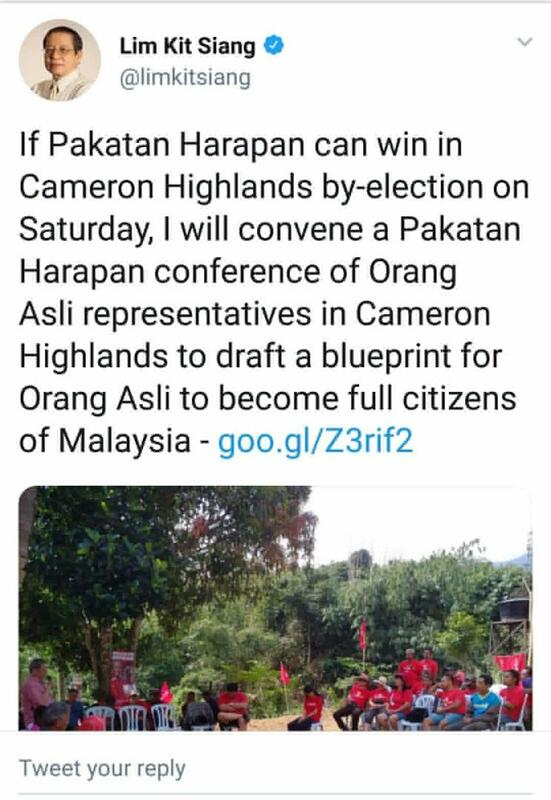 Prior to that, Guan Eng displayed his lack of sensivity to threaten the Cameron Highland voters. He said if they want development, they should vote the DAP candidate. With the audio and video viraling, the idiot Senator had no shame to try to deny. Then, this Orang Asli politician could likely be autistic. It is the same political line of the then BN federal government and echoed by Muhyiddin and Fuziah Salleh. Guan Eng’s signs of retardation have been for quite a while. Could it have spread from BN to Muhyiddin and then spread to Fuziah and Guan Eng? 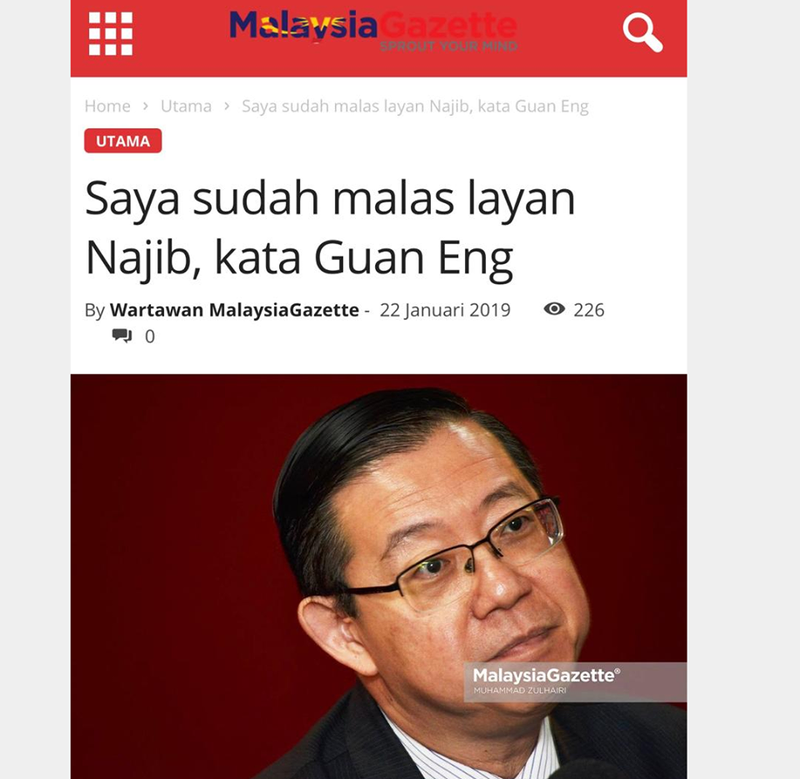 Actually, one would have notice that Guan Eng’s meant to counter BN’s slogan, Tiada Janji, Lihat Sendiri and defend the senior Lim failed critic of Najib’s inability to bring development to the Orang Asli. Lim Kit Siang focused on the Orang Asli means that the ket to winning CH is them. He visited and campaigned there before the by-election date commenced. DAP also illegally put up posters, flags and banners with non-candidate face before the date. Its an organisational inability to know what others think and feel. 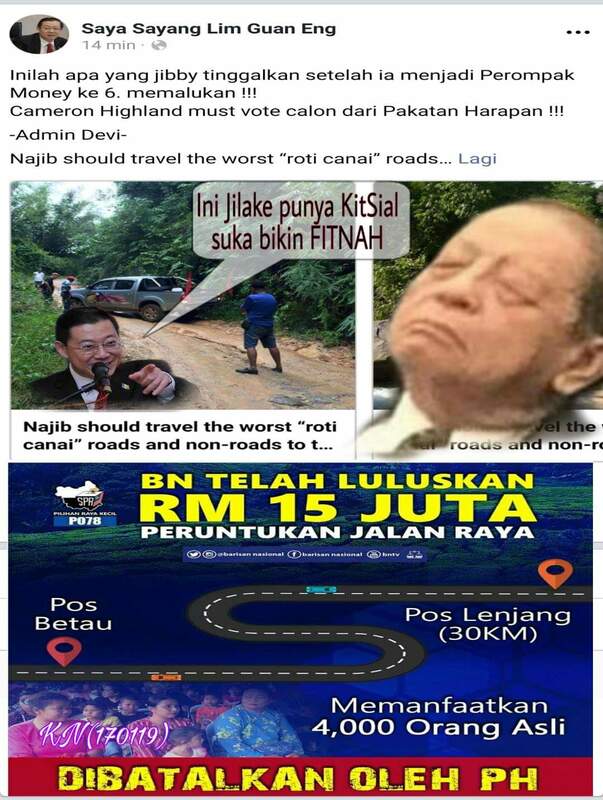 “Jabatan Hutan tidak bagi pinjam 4WD.” Another good one from Najib in his FB. Ha ha ha …he was taking potshot at BERSIH too. 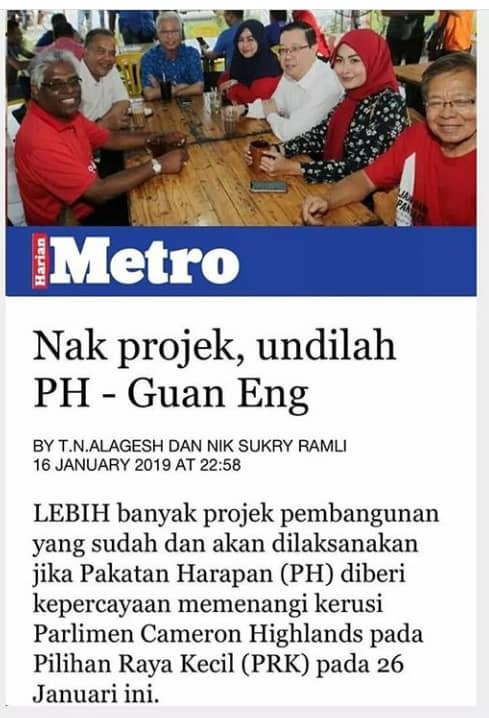 “Saya lihat rata-rata pemimpin PH cuba memberi alasan mengapa bantuan dan projek mesra rakyat perlu dimansuhkan dan dipotong. “Hutang RM1 trilion. 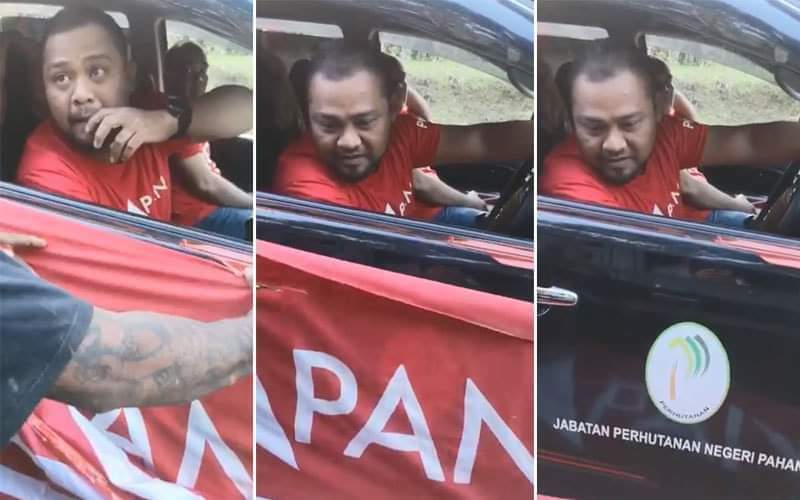 Kerajaan dah tak ada duit, di curi BN.” diulang berkali-kali oleh PH. Bab hutang RM1 trilion, saya tak mahu ulas dengan mendalam lagi kerana saya telah penat menjelaskan. 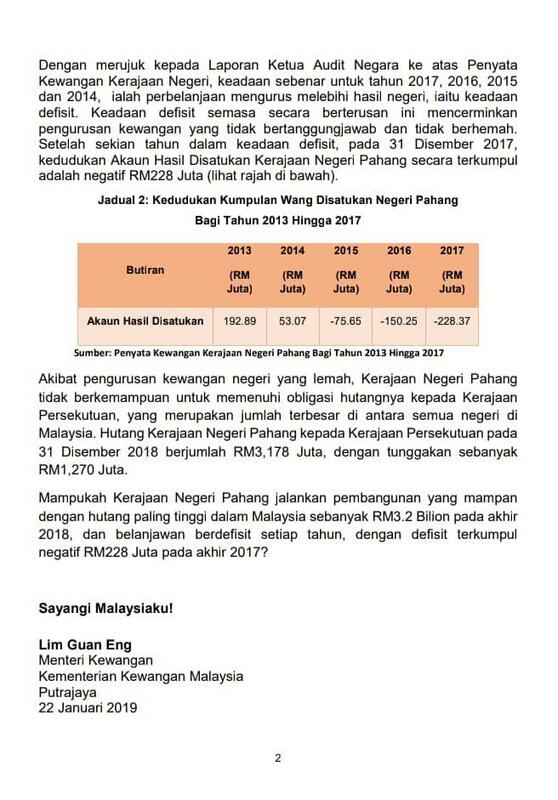 “Lebih elok Guan Eng kira sampai tahun 2200. “Hutang RM10 trilion lebih sedap didengar. 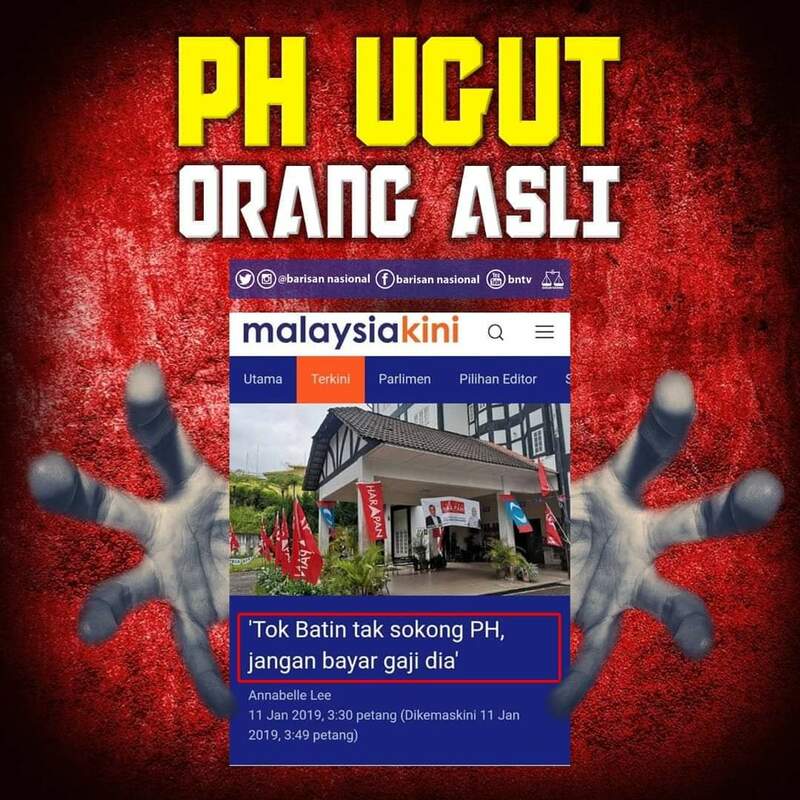 “Hari ini saya nak bongkarkan satu lagi penipuan Guan Eng dan PH. “Ianya jelas menunjukkan pendapatan, perbelanjaan dan defisit kerajaan selepas PRU14, iaitu dari bulan Mei ke November adalah lebih tinggi berbanding tempoh yang sama tahun lepas di bawah BN. “Kita maklum bahawa kerajaan telah hilang sekurang-kurangnya RM40 bilion kerana telah gantikan GST dengan SST serta tempoh bebas cukai selama 3 bulan tahun lepas. “Mengapa pula pendapatan kerajaan boleh lebih tinggi berbanding tahun lepas? “Ini ialah kerana PH telah jarah RM82 bilion dari rizab Petronas serta mengarahkan Khazanah dan BNM untuk membayar kepada kerajaan bagi menampung kehilangan hasil GST seperti yang diakui oleh Guan Eng sebelum ini. “Tetapi yang lebih mencurigakan ialah perbelanjaan kerajaan di bawah PH adalah lebih tinggi berbanding BN walaupun rata-rata bantuan kepada rakyat telah dimansuhkan atau dikurangkan. “Di mana perginya perbelanjaan ini pula? Untuk siapa? Mengapa lebih tinggi? “Oleh itu, defisit negara dan hutang negara juga meningkat di bawah kerajaan PH walaupun bantuan kepada rakyat telah dicantas. 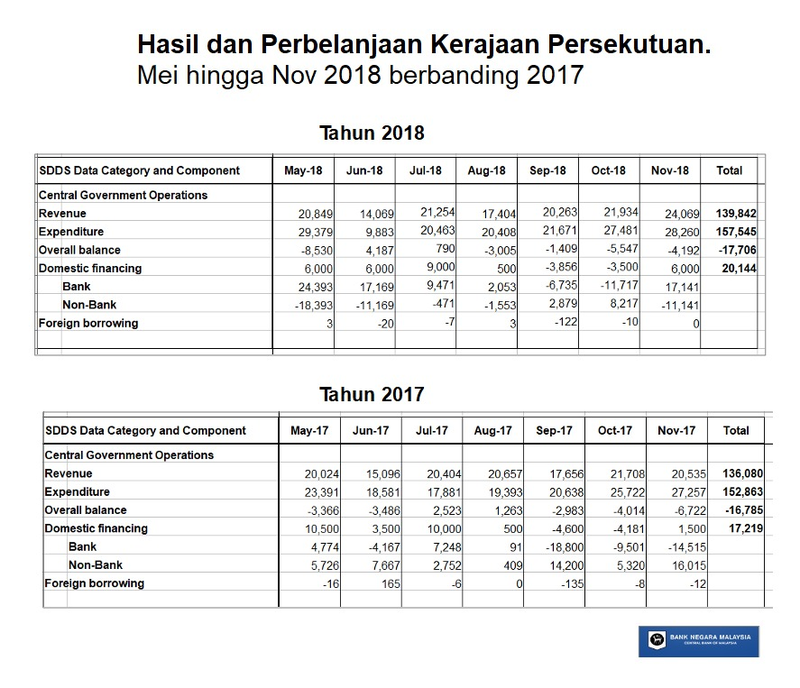 “Mengikut belanjawan 2019 PH, defisit untuk tahun 2018 (-3.7%) dan untuk tahun 2019 (-3.4%) adalah lebih tinggi berbanding unjuran defisit tahun 2018 di bawah BN (-2.8%). 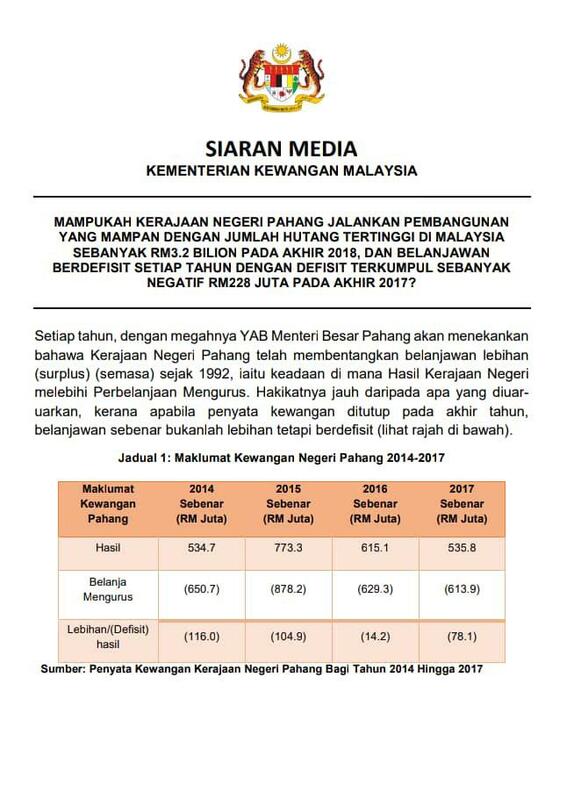 “Hutang rasmi negara juga dijangka meningkat kepada RM820 bilion pada akhir tahun 2019 berbanding RM686 bilion pada masa BN. “Sebelum PRU14, PH sering berjanji mereka akan menurunkan perbelanjaan kerajaan sebanyak 20% dengan mengurangkan rasuah, pembaziran dan penyelewangan. “Tetapi apa sudah jadi hari ini? “Sebaliknya perbelanjaan, defisit dan hutang bertambah. “Kalau ikut logik PH sebelum ini, adakah rasuah, pembaziran dan penyelewangan telah bertambah di dalam tangan mereka? The frenzy or tantrum among retardation is called meltdown. It happens when the person with retardation could not get what he or she wanted or people do not understand them. During meltdowns, they are unaware of their action and may accidentally hurt themselves. Was hoping he responded to Najib’s allegation he “jual negara” in Penang. The retardation attribute to be insensitive to others, repetitive and talking in frenzy had been with the senior Lim for quite sometime. Unfortunately, his critics resorted to racist labeling and name calling him as “Apek”. However, it is not sure whether this statement is due to his retardation or senility. Except for cases of documentation, the Orang Asli is not only citizens, but Bumiputera or Pribumi, whichever one wish to call except the DAP-inspired Orang Asal. You are the government. Just do the damn blueprint and not after winning CH by-election. Nampak sangat Kit Saing tak ikhlas. No sensitivity to others’ thinking. Really, there could be many more retardation cases within PH. You tahu siapa curi Negara punya wang. You pun tau. Saya kesian juga, Dr. Mahathir hari-hari marah sama saya. Antara orang yang paling takut saya jadi Perdana Menteri ialah Mahathir. Dia demam tau. Kemudian ada orang beritahu, “Mahathir, Anwar mungkin jadi Perdana Menteri. Terus dia bangun, tak boleh, kata dia haha. You tau apasal takut? Sebab harta sudah banyak. 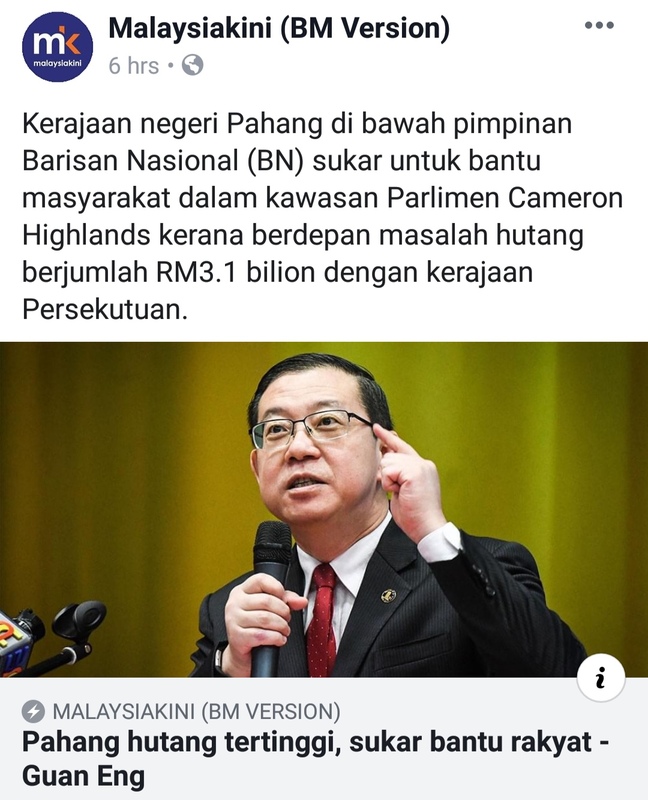 Harta anak-anak dia berpuluh puluh billion. Tengok kontrak Petronas. Siapa dapat banyak? Kencana Petroleum. Mokhzani Tun Mahathir. Semua dia angkut. Takdak melayu pandai berniagakah? Tak da Cina, Dayak pandai berniagakah? Semua anak dia punyakah? Itu satu. Kemudian beli itu beer punya company. St Migul Filipina. Saya punya meja takdak. Carlsberg takdak. Tetapi Mahathir punya anak, Mirzan beli..beer punya company.. Aiyoo! Kadawale..Berapa harga? 2900 juta cash..RM 2.9 billion cash! Mana angkut (dapat duit)? Menang loteri tiap hari? Dia menang loteri, every month for 20 years. Kemudian selepas ambil St Miguel ini untung. Beli Esso Malaysia. Kalau tak salah kira-kira RM 1.7 billion. Tukar nama kepada Petron. Semalam, Malaysia Airlines. Siapa dia penasihat petronas? Mahathir. Semalam Malaysia Airlines umum, pertama sekali dalam sejarah dan ini satu syarikat penerbangan di dunia yang beli minyak untuk enam bulan ini, tiada syarikat penerbangan lain (lakukannya). Malaysia Airlines hanya akan beli dari syarikat minyak (milik) anak Mahathir, Petron – 6 bulan. SAYA MAU TANYA INI NEGERI.. BAPAK YOU ATAU RAKYAT PUNYA? KALAU RAKYAT PUNYA, HENTIKAN BENDA MENGARUT INI. 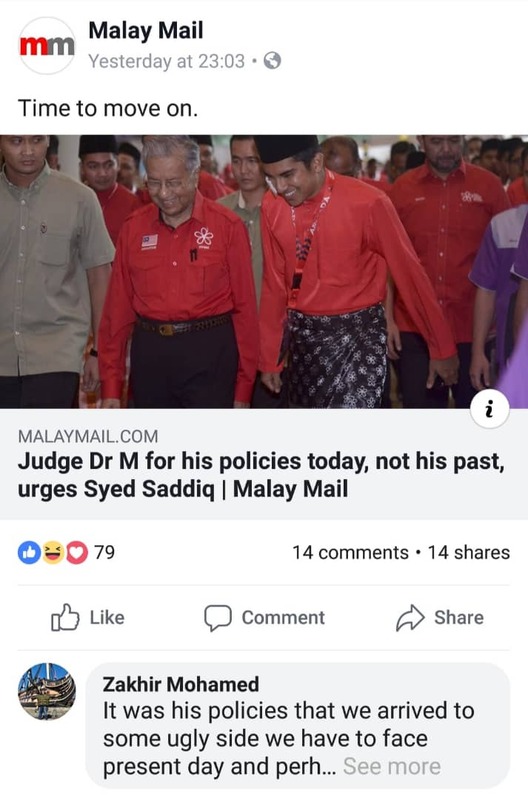 One would have thought it should be Tun that is senile but from the comments, Syed Saddiq could be naive or senile. However, he is too young to be senile thus it is more likely the inability to know what others’ think or feel. Tun does love to repeat things. Political retardation perhaps? 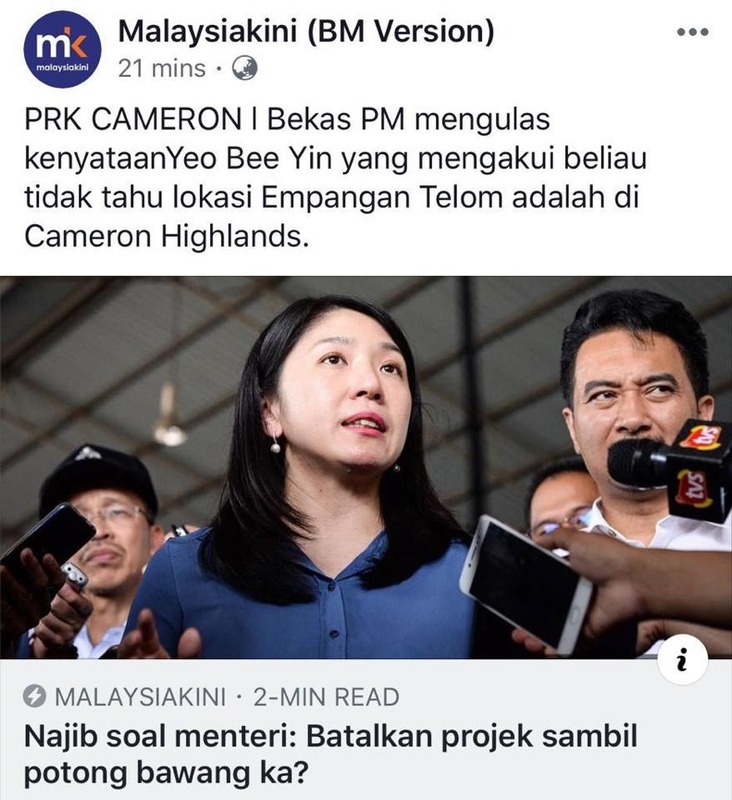 Initially, Yeo Bee Yin was impressive in the early part of her handling of Lynas. It later turned out to be disappointing. 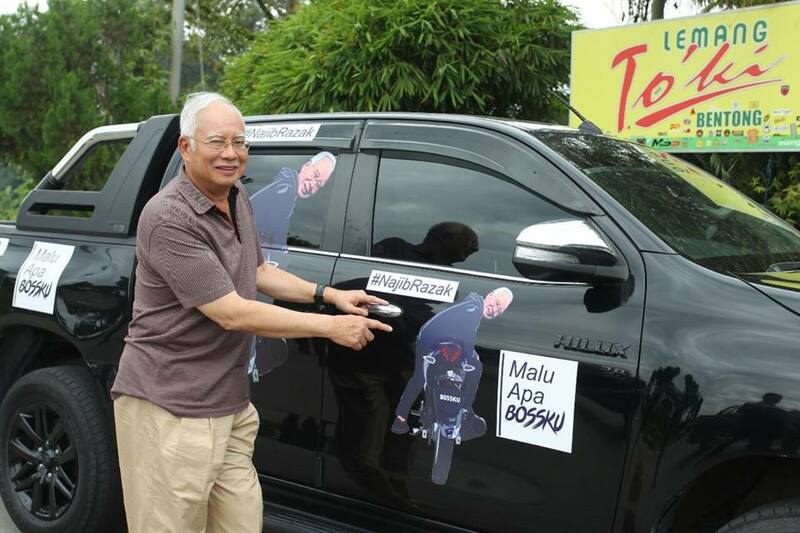 And, is this another political retardation or as Najib trolled, stupidity? The toll of governing may have got to them. They will run out of excuses to evade fulfilling election promises. ISMA suggested to form a new government or call for general election.